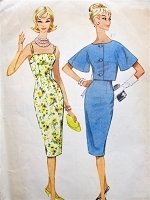 McCall's 4731; ©1958; Designed exclusively for McCall's by Pauline Trigère - Misses' Dress and Sleeveless Bolero. Camisole top dress with fitted bodice and full gathered skirt. 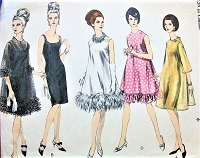 Skirt inset at center front under inverted pleat. Bodice faced with self fabric, skirt lined with interfacing fabric. Back zipper closing. Sleeveless bolero is single breasted, unlined, bound at neck and armholes with self fabric.